Uncaria tomentosa (common in the US and Canada). 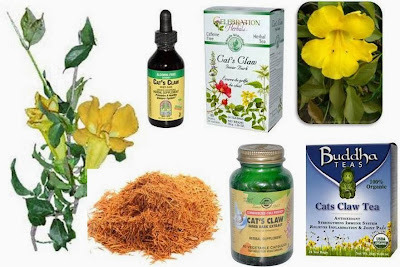 Cat's claw is available in dry powder, tea, tincture and supplement form. Rheumatoid arthritis (chronic inflammation – occurs in matching joints on both sides of the body, can also effect blood, eyes, lungs, heart and/or nerves). Digestive System disorders – i.e. Cat’s Claw may lower blood pressure. Medications that decrease the immune system (i.e. corticosteroid medicines, cyclosporine, prednisone, etc.) as Cat’s Claw is an immune system booster and contains natural cortisone. Thank you so VERY much for giving such comprehensive information on each remedy! I am desperately searching for a holistic approach to treating my cat's chronic diarrhea since the "normal" vet gives diazepam which needs blood tests because it may harm other organs!! Your info certainly helps narrow down what would be best to use.